I have some new recent milestones to note. First, last Monday, I drove solo for the first time since my accident. The weekend before, I practiced driving in a big empty parking lot and on the empty streets of an industrial park. I managed to park and corner and not run Karen over, so she granted me permission to drive myself to the dentist. I am using extra caution—my left-side blind spot really is a blind spot at the moment—but feel pretty good about being back on the road. I won’t be driving a lot or at night anytime soon, because I am not seeing well in low light and am not adjusting quickly to changes in light, as with oncoming and passing headlights, but it is good to know that I am not entirely dependent on others to get around. Thursday, I finally finished the vessel I was working on when I had my accident. 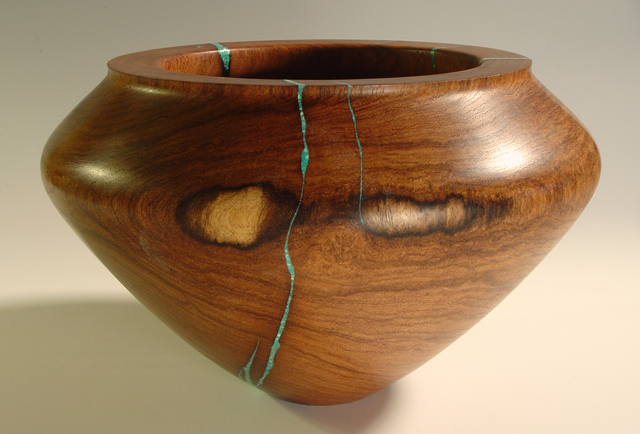 I epoxied it back together and filled the exterior cracks with turquoise inlay. It is now lucky number 13 in the commissioned series. 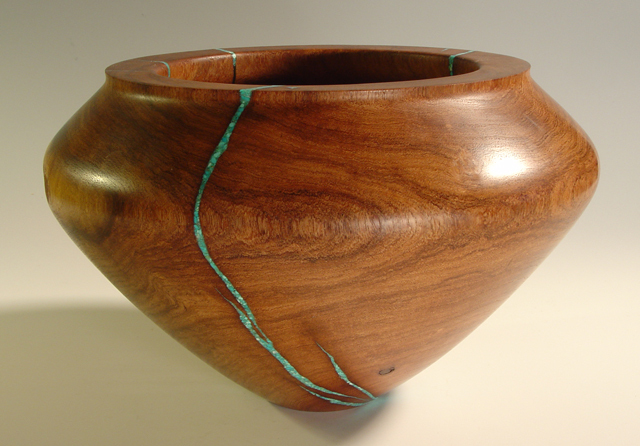 The vessel that broke and hit me, now repaired and finished. Another view of the vessel. I like that these sapwood patches look like eyes–and the left one (on the right in the photo) matches mine at the moment! And on Monday, I started the first of the last four vessels in the series—from another highly cracked log. I used the wire guard on my lathe and wore my riot helmet for protection. The wire guard does interfere with seeing the curve I am cutting, so I probably will not use it for the final external shaping, but I will continue to use it for the rough turning of these vessels and while I hollow the interiors. I am pleased with the riot helmet. It is not too heavy. My head got a little sweaty, but that’s not a big deal for me. Oh, and today, I used my chainsaw. Finally, it appears that I will pass a major milestone at the end of February: Dr. Harris says the silicone oil in my eye can come out. She will perform another laser procedure next Tuesday just to make sure my retina is securely tacked down, and three weeks after that, she says, I can have the surgery. I was expecting to have to wait six months from the October surgery, but she says I am ready, or will be (it will be four and a half months by the time the surgery happens). My understanding is that she will replace the silicone oil with saline. I am hoping that this will improve my vision. When you compare photos of the retina in each of my eyes, the right is sharp and the left is dim and blurry, because of the oil. I still won’t have a lens, but I hope that what I can see will be a little clearer and brighter without the oil. And after I heal from that surgery, I can be measured accurately for a new lens, so maybe that will happen sooner than expected too. I don’t want to rush—I want to give my eye all the time it needs to heal as much as it can—but I am anxious to see better. Over the course of my recovery, I have received a number of things from well-wishers to help me with my healing. One of the first was a small jar of dirt from the chapel in Chimayó, New Mexico, el Santuario de Chimayó, where a miracle is believed to have happened some 200 years ago and where pilgrims continue to visit seeking healing. Karen and I visited it ourselves some years ago. The little jar, shared by someone who has also made me wonderful soup several times over the last few months, sat on the table next to me during the long weeks when I had to remain upright and remains close at hand. I will pass it on when my recovery is complete. On loan since before Halloween is a small mascot, a stuffed zombie kitten made by a librarian colleague of Karen. I call it Cyclops. You cannot quite tell from the photo below, but its right eye is hanging out of its head. It is at once adorable, pitiful, and funny. It has helped me keep a balanced perspective throughout the ups and downs of this process. 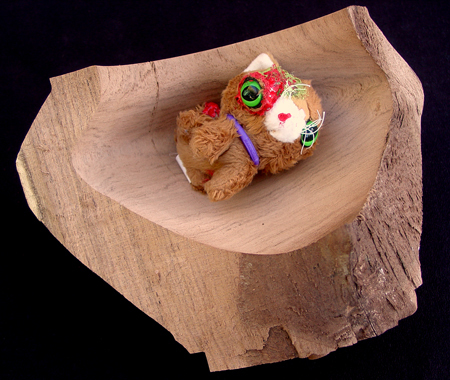 Zombie kitten mascot, posed on the mesquite chunk that hit me. Notice how little solid wood was holding the vessel together. 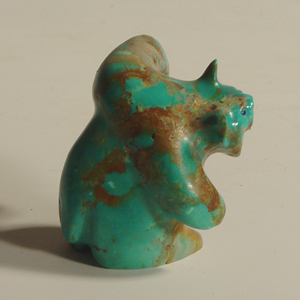 One of my collectors gave me a turquoise Zuni fetish of a dancing bear. I call her Ursalyn. Bears are symbolic of vigor and health, and her smile and dancing make me smile. She reminds me of me. 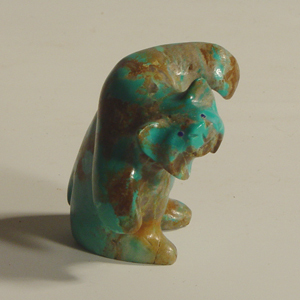 Turquoise is a healing stone and also happens to be my birthstone. She dances next to me while I watch TV or eat or work on the computer. than the simple, untested surface before. Read the full text of the poem here. More than scars, it is about love. I reread it often. The most recent healing aid is from my dear friends Pat and Darcey, who have been present at every step of my recovery. At my birthday, they put together a medicine bag for me, a small leather bag that contains a chunk of turquoise, a shell, a small bundle of sage, a shell, a feather, a sandstone rock, and a slice of mesquite. I wear it around my neck or keep it on the table next to me. Sometimes I unpack it to contemplate its contents. These things all help. Beyond their respective healing powers, each reminds me that people care. They are my steady companions on an unsteady road. On Wednesday, I turned! My friend Art supervised me. I started with some spindle work just to see how it felt to be at the lathe cutting wood. It felt completely natural. I have not lost any muscle memory, and I didn’t notice any obvious challenges from my limited depth perception until I used the bandsaw to prep a blank and then, hardest of all, the drill press. Matching the tip of the drill bit to a marked center point proved to be the most challenging task of the day. I was nervous at the bandsaw, but I’m always on high alert at the bandsaw, and the extra nerves calmed as soon as I got the teeth into the wood. After the spindle work, I played with shaping and hollowing an end-grain vessel and then moved on to turning a new face-grain bowl. Using a gouge felt easy and familiar. Oddly, it was a square-end negative-rake scraper, one of the easiest tools ever to use, that felt the most awkward. I had to remain extra aware of where the points were at all times. It is one tool that I tend to look back at as I cut. When I use a gouge or other tools, I am looking at the far edge of the wood, not at the tool; I think that is why my limited depth perception did not bother me. On the inside of bowls, I am cutting by feel anyway. One shortcoming I did notice: I do not see detail as well as I used to. This, I hope, will improve when I get some new glasses. The pair I have been wearing doesn’t sit quite right on my face because of the plastic guard I wear over my injured eye. In addition, the remaining lens (the left one popped out) is badly scratched right across the center of vision. I didn’t notice some small areas of tearout until I was well into sanding. I had to go back to cutting a couple of times to clean up both the exterior and the interior surfaces. Here is my first monocular bowl! 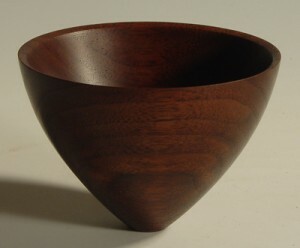 A small walnut bowl, my first since my accident. My second milestone is that I am no longer wearing an eyepatch during the day. I still cover my eye at night, with both a gauze pad and my plastic shield, but while I am awake, my eye is naked! I cannot keep it open very wide for very long right now, but that will come. Using my forehead muscles as well as my eyelid muscles, I can open my eye maybe three-sixteenths of an inch—just enough to see through. It quickly droops to an eighth of an inch or less, but I am working those muscles, blinking and looking as much as I can. My lower eyelid looks pretty good, considering. The graft has taken, and the lid is looking more normal. I have not detected any movement in it yet. I still have a ways to go with my recovery, but these recent milestones leave me optimistic. Recent photographs of my retina made me realize that my visualization of its healing has been backward. I had been picturing the black spot in my vision being eaten away or erased. Now I realize that the black spot reflects a bare patch where the cells were damaged, so I am picturing instead some new seed-cells taking root and beginning to grow. Help me grow my retina garden by picturing it too! 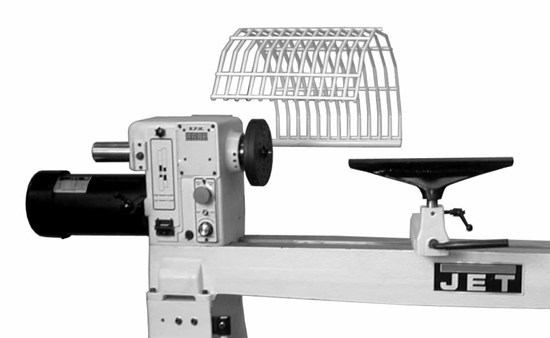 One of the possibilities I considered was the Trend Airshield Pro, which is very popular among woodturners. I discovered, however, that it claims to meet only the “low energy impact” standard for eye protection (http://www.trendairshield.com/specifications.html) and its stated respiratory protection is also lower than what I already have (and it is not NIOSH approved). The safety standard for eyeglasses and face shields is specified in ANSI Z87.1-2010, which includes general specifications and impact specifications. It is the general specifications that the Trend Airshield Pro meets. My Bionic face shield is rated for the high-impact Z87.1 specifications. I did the math (see below) and realized that, measured in kinetic energy, the mesquite missile that hit me delivered about 30 times the amount derived from the high-impact Z87.1 specs. Surely, my face shield would have absorbed some of that energy, but I almost certainly would have been injured anyway. Polycarbonate isn’t supposed to break or shatter, but all that energy would have had to go somewhere. Could I have escaped with bruising and a concussion? Would my face bones still have broken? Would the impact have contacted my eye? Does anyone have any experience they can share? Anyway, I went further with my research and looked into ballistic face shields. These are expensive and heavy and seem to me like overkill (they are also not readily available to civilians). But they did lead me to riot helmets and face shields, regulated under the NIJ 0104.02 standard, with about 15 to 27 times the impact resistance specified under ANSI Z87.1. I ended up buying the lightest one I could find, the Max Pro RD1002X; it weighs 2 lb 3 oz, just a little more than the Trend Airshield Pro. Others weigh 3 lb or more, which I thought might be a bit heavy for prolonged wearing. I should receive it in a week and will report on how it feels. 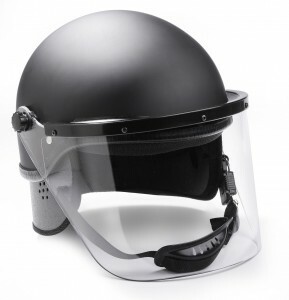 You may notice that the impact resistance of the riot helmet is still not equal to the impact I sustained in my accident; at best, it is 15% too low. I balanced the impact resistance against potential comfort (weight) and cost and also reasoned that damage to this helmet would still mean considerably reduced damage to me. My intention is to wear my Bionic face shield with my respirator when turning most things (most of what I turn is small and light), but to wear the Max Pro with my respirator when turning heavier pieces, especially when working with cracked wood. I also installed the wire guard that came with my Jet 1642 lathe and will see how that feels. I have read that others don’t like using it, but I’ll try it to see if it interferes with visibility or tool use. The wire guard on the Jet 1642 lathe. For the technically minded among you, below is a summary of the kinetic energy figures derived from the specifications and my calculations. I give the foot-pound equivalents for kinetic energy for those more familiar with the units used in ballistic specs. This is a simplification, of course. The numbers don’t take into account air resistance, drag, pressure, or other factors. They just gives me a means of meaningful comparison. Australia and New Zealand have higher impact standards. (Their medium impact standard is close to the ANSI Z87.1 impact standard—at least for eyeglasses. Cannot find their face shield specs.) Their test for high velocity uses a 6.35-mm (¼-inch) steel ball traveling at 120 m/sec. This yields a kinetic energy figure of about 7.5 joules, compared to 4 joules under Z87.1. The Triton Powered Respirator meets this higher standard, and its shield is indeed thicker than that of the Bionic face shield. I did not check the helmet or respiratory standards for this device. Oops! The Triton respirator may no longer be available: I can’t find it even on the Triton web site. Dr. Polonski removed the stitches from my lower eyelid the day before yesterday, on my birthday. This time, for the first time, after looking at his work closely, he said, “Lynne, I’m happy.” I had a scare that night, though, thinking that the skin was slipping. He saw me the next morning and assured me that all is looking as expected and that I could expect the appearance of the graft to change and vary considerably over the next few months. I’m still nervous about the skin, but the rest of the graft seems to be holding well. Well, it turns out that reconstructing an eyelid is hard. The graft is holding, but it’s going to take another surgery for each lid to refine them properly. Sigh. Guess I’m going to frightening strangers with my naked eye for at least a few months more. I go in this afternoon for surgery to reconstruct my lower eyelid. Dr. Polonski will use a graft of skin and cartilage from the back of my ear to make a lid that looks relatively normal (though it will lack eyelashes) and that will (fingers crossed) be able to function. Most exciting, when it heals I should be able to go without an eye patch. Exposing my eye may not look so pretty for a while, but it will give my eyelids more practice blinking, and that should strengthen both the muscle and the nerve (if nerves can be said to have strength) and get me a big step closer to having full vision again. I will be under general anaesthesia for this. I was supposed to get a local, but that changed yesterday when I went in for an unscheduled visit with Dr. Polonski. I called him because my face has been swollen. At one point all the swelling had gone down, but in the past few weeks it has returned. Dr. Polonski says the lymphatic vessels are not draining the fluid properly, and he is going to try to help that during this surgery. He may also remove the tiny tube in my nose that has been allowing for drainage from my tear duct. I seem to be able to tear normally, so I think the tube is no longer necessary. These additional procedures will be painful, he says; hence, the need for general. I hope I wake up more easily this time. Think of me blinking! Thank you all again for sharing with me your positive thoughts, prayers, energy. I don’t know why I sent out the original email blast announcing my accident. It was uncharacteristic: I have become, over the last couple of decades, reflexively private, tending to answer personal questions, however friendly, with a vague word or three, and an edge of “Why do you ask?” underlying my tone. So why share something so personal—and continue to share, through my blog—without even being asked? What impulse led me to this uncharacteristic act? I don’t know. At the time, it was beyond question, just something I should do. Whatever the reason, the repercussions of following that impulse have the potential to change me radically, if I can allow it. The flood of good will I received in response to my email astonished me. I figured I would hear from friends, but acquaintances and strangers alike have taken the time (!) to write me, sending messages of sympathy and solicitude, sincerely wishing me well. Some have forwarded the news to others, who have also responded. People have prayed for me, in all the various forms of action and energy prayer can take, and many continue, months later, to keep me in their thoughts. Some have opened up and shared their own encouraging stories of injury and healing. Some have thanked me (!) for sharing my story, for motivating them to work more safely. Some have offered help—real, genuine help. I am not accustomed to letting people help me. My beloved, traumatized partner stepped up to take care of me in a way neither of us knew she could, setting aside her fears to tend daily to my ugly injured eye. My sisters dropped everything and came straightaway. My older sister, Amaranth, stayed for four full weeks, taking over my care during the day so that Karen could get back to work and applying homeopathy to help me heal. My younger sister, Angie, could only stay a week but remained on call to fly back if she was needed; she tracked my recovery faithfully and enlisted practically everyone she knows to pray for me. My mother lovingly cooked for me, foods soft enough for me to eat without chewing, comfort foods that nourished me body and soul. Sharon, a friend from long ago who had no reason to care so much in the present, wrote beautiful visualizations that showed me how to heal even when I lost my bearings. My friends Pat and Darcey stayed with Karen at the emergency room and during my retina surgery and have been constant sources of humor, support, treats, and substantial help (it was they who just enabled me to participate in the open-studio tour). My friend Art rigged a remote control for my fan so that I could stay comfortable tucked upright in my chair, and brought bags of DVDs and audio books to entertain me. Karen’s family continues to provide long-distance support for both Karen and me. Many more friends have offered help that we haven’t yet needed to call upon (but may still). And gifts. Flowers and food baskets. 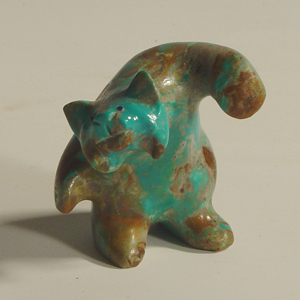 A Zuni fetish dancing bear. A lovely poem. Money. The local woodturning club (which I helped found, back when I had just learned to turn) voted to give me a substantial donation toward my medical expenses. I cried when I received the check. My collectors all bought work, as did some friends who I’m pretty sure didn’t need it. Someone who doesn’t want to acquire any more stuff slipped me a check in a card. Someone else paid twice the amount for an item and wouldn’t take change. Another person quietly handed me an envelope containing a lovely note—and another check. Such kindness is a revelation. I had not realized how cynical I had become. I don’t know how to take in all this goodness. I am utterly humbled by this generosity. What have I ever done to deserve all this? If I can answer this cry, how different might I be? When my friend Art, ready to take umbrage on my behalf, mentioned recently that a prominent Buddhist teacher had just declared flatly that all bad experiences are due to karma, I realized that I haven’t been experiencing this injury as “bad” (not that my karma might not justify a bad experience). Day after day, what I have been experiencing is goodness, gratitude, grace. Perhaps this feeling won’t last, but perhaps it will: perhaps in the end this will have been not an injury but a blessing. And should I prove unable to fully accept this blessing and its deeper healing, I will, at the very least, endeavor quietly to be worthy of it. The past couple of days have been good ones. Not only did Karen’s parents in New Jersey finally get their power back on (hurrah! ), but there is definite progress in my healing. My retina is flat, as it should be, although there is a patch of wrinkling to one side that Dr. Harris will fix using a laser at her office next Tuesday. And my left upper eyelid is definitely beginning to move in concert with the right when I blink! I’m so excited! Further, in about three weeks, Dr. Polonski will reconstruct my lower lid using skin and cartilage grafts from the back of my ear. And he is no longer considering whacking my face with a mallet: now that the swelling has gone down more, he is pleased with how symmetrical my face is looking. And my grin is only a little lopsided now. It gets bigger every day too. I have been officially cleared for all normal activity, including sleeping any way I want and chewing on the left side (no jawbreakers though!) and lifting heavy-ish objects. I have been spending time in my studio cleaning up for visitors this weekend, and it feels good to be dirty with sawdust again, even if I am not yet making anything. Next week, I will start to play with making. I have washed my bloody apron and work pants and cleaned my bloody respirator, and I am happy to be wearing them again to work. Both doctors essentially admitted this week that I am recovering much better than they ever expected, given the severity of my injuries. I am glad that I did not know their expectations or reservations before now. I am still planning on a full recovery—with the help of all of your good wishes and prayers. Because of my injury, I had to cancel the shows I was planning to participate in this fall, but one event had already published my participation, and since it involves minimal setup and I will have help from a dear friend (thank you, Pat! ), I have decided to go ahead with it. I will welcome visitors to my studio as part of the Tucson Open Studio Tour this coming weekend, November 10 and 11, from 11 a.m. to 5 p.m. on both Saturday and Sunday. I encourage you to come earlier in the day if you can, since I cannot guarantee how long my energy will hold up. (Please be patient with me if I need rest breaks throughout the weekend.) At present, this will be the only event this fall at which I will be selling my work, so please do come by for some of your holiday shopping. Pity purchases are welcome—I’m not proud and I do have a stack of unplanned-for bills to pay. If you cannot come but are interested in buying, please email me or call me at 520-760-8938 to arrange to see what work I have available. For my address and a complete list of the artists and locations participating in the Tucson Open Studio Tour, see the Tucson Pima Arts Council web site. Thank you for your continued support. I hope to see you this weekend.